Hello dear, I’m the one they call “The Malignant Dreamer”. Don’t worry, it’s just a name. I would describe myself more as ‘Glorious’. We’re here because the idiot designer of our nightmare didn’t manage to write all of the cards and rules in a completely clear and unambiguous way and someone has to clean up his mess so that we can both get back into that hellscape. 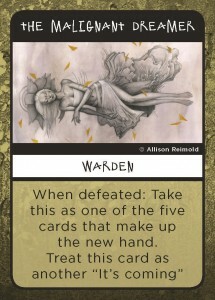 This page contains rulings for specific cards or situations for Enter the Nightmare. If you’ve got a question that I don’t answer here I’d encourage you to harass the designer at [email protected] He’s got it coming. 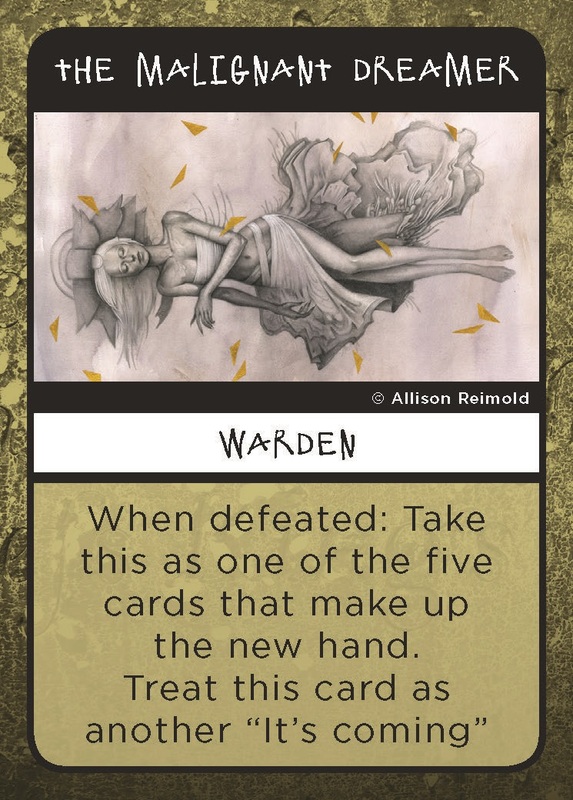 Rules (Defeating Wardens): If I defeat a warden and someone else had an unfinished action are we doomed before or after the warden is removed? What happens if several people had unfinished actions? An unfinished action dooms you after the current warden is defeated, if several people have unfinished actions then you’re doomed several times. Congratulations, you’ve managed to be a more complete loser than any of us had thought to account for. Rules (Pauses): When the game is paused (for example to defeat a warden) can we make it a really long pause and work out every trade and action in detail until the next pause? Clearly you already know the answer, unless you are the storied Enemy of Fun, of course you can’t. In fact you shouldn’t be discussing your next trades during pauses at all, since the discussions are part of the game and the game is paused. Rules (Pauses): If I was under a restriction when the game was paused, does it still apply once the pause has ended? No, the restriction no longer applies. Assuming that the game was paused for a partial doom or a warden being defeated as per the rules. You can’t escape your restrictions because one of you stopped to answer the phone. Rules (Time): How fast is the doom count? Approximately one second per count, but speed will vary slightly from person to person and most people will naturally slow down very slightly when they can see their end approaching. I love those moments. As long as you’re not actively trying to get a tactical advantage out of taking a long time to pronounce numbers you’re not cheating – at least in this regard. If it really bothers you then you grab an app that’ll count seconds for you. Ooh, or get a metronome! Those things don’t see enough use anymore. Death (Doom): What if there isn’t a doom count? Assuming you’ve not become completely muddled and included Death in an escape game then there’s always a doom count. ‘It’s Coming’ can’t be discarded and has its effect if it’s anywhere in your hand. If you’re being strangled the doom count might be ‘as long as someone can hold their breath’ but it’s still there. It has a first three seconds and a last three seconds. You can say “I need to trade this in the last three seconds so flail your arms frantically when you’re a few seconds away from needing to breathe in”. Death (Stop): How do I stop people from trading? Well, unless you have a very specific type of relationship it’s probably not okay to staple their cards to their hands, which rules out the most obvious approach. I’ve got nothing against unusual relationships – I would do any number of terrible things – but perhaps you’re search for an answer that’s suitable for all groups of players? Hmm…tricky. Perhaps it’d work if you asked them nicely not to trade and point out that you’ll all die if they do? Delirium (Lines): What if nobody knows the next line of the song? With luck you’ll die, since they can’t spontaneously complete your objective. However I suppose you could tell them what the next line is. You could even sing a different song, nobody said that you had to complete the action on your first attempt. However, given the time limit it’s still probably better to pick something that your friends would know. If you’re playing with strangers nursery rhymes might work, 98%* of all strangers either are now, or were once, children. Delirium (People): What is the song of my people? Dear, I feel that you really ought to know that. Pick a group, culture or ideal that you belong to and the pick any song that is either about them or important to them. Alternatively sing a song that you make up as you go along that expresses how you’re feeling. One dreamer treated me to a stirring rendition of “I hate you for giving me this gosh darned card.” They might have used slightly different language. Isolation (Lies): What happens if my card obliges me to lie but in order for another player to complete their action I need to say something true? Then you’re unable to help them complete their action, maybe someone else will do it. Then again, maybe not. I suppose you could also trade the lies to someone else and then help them – they’ll only perish if they themselves make a trade after all. Tentacles (Old) What if you have to trade the oldest card in your hand but two are equally old (say you’ve just redrawn after defeating a warden)? Choose any one of those cards to be your oldest card. If you’re feeling particularly rigorous you could limit it to the one that was physically handed to you last or that was on the bottom of the stack if they were all handed to you together. You don’t need to go that far but it’s always amusing to see someone destroyed by their own sense of self righteousness. Wilderness (Shuffle) If I get another player to shuffle their hand, what do they shuffle it with? My hand? I’m tempted to say yes, since that’d make it almost impossible to complete a Wildnerness set. Alas the truth is more mundane, they simply shuffle their hand. Some dreamers try to order their hand, keeping sets together or having cards that are ‘safe’ to trade in particular locations, this is just a way to disrupt that. One of the few times that you’d benefit from having a friend who’s already thoroughly disorganised I suppose. Wardens (Shattermind): How does Shattermind interact with “It’s Coming” or other cards that require you to say particular things? If you think you cannot count down from ten without interjecting a name as every other word you have never heard one count “One Mississippi Two Mississippi”. Though strictly there is no requirement for it to be every other word, so you could just as well spew a string of names once you’d traded the card away – just make sure that nobody ends the round before you do. In that case it should be treated as an action you did not complete, or to phrase it more directly: A failure. Wardens (Mouthtower): Okay but what about Mouthtower? Surely you can’t expect us to have someone match pace with the counting player and interject another word after each number? That’s a matter of perspective, I do believe that I can expect you to manage exactly that. You would want to disappoint me would you? The game designer hasn’t found a good place to put these yet so instead of letting me end on a high point he’s insisting on keeping the list here. I guess you won’t have far to look for that disorganised friend I recommended earlier. How do Mouthtower and Shattermind, which restrict what you can say, interact with It’s Coming or nightmares that make you say things, like “Sing the Song of your people” or even Shout ‘Save me'”?